Confers on Him the First Black History Month National Black Excellence and Exceptional African Leadership Award. President Muhammadu Buhari receives the family members of the late Martin Luther King Jnr at the presidential villa in Abuja. 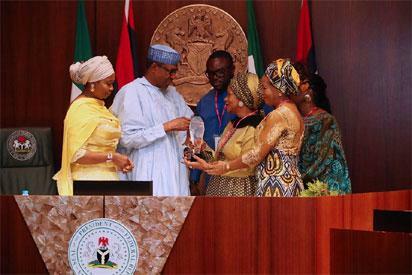 President Muhammadu Buhari was conferred with Black history award for his exceptional leadership in Africa. The award was presented to him by Late Martin Luther King’s family who paid him a visit earlier on Monday at the presidential villa. Lauretta Onochie, the President's personal assistant on Social Media said. 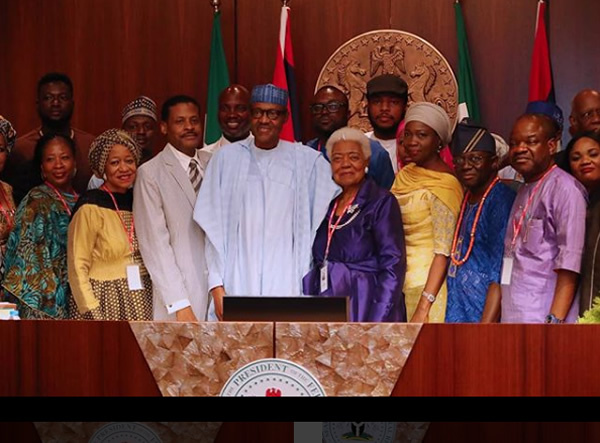 She wrote alongside pictures shared: “President Buhari receives the First Black History Month National Black Excellence and Exceptional African Leadership Award 2018 from Martin Luther King’s JNR Family. 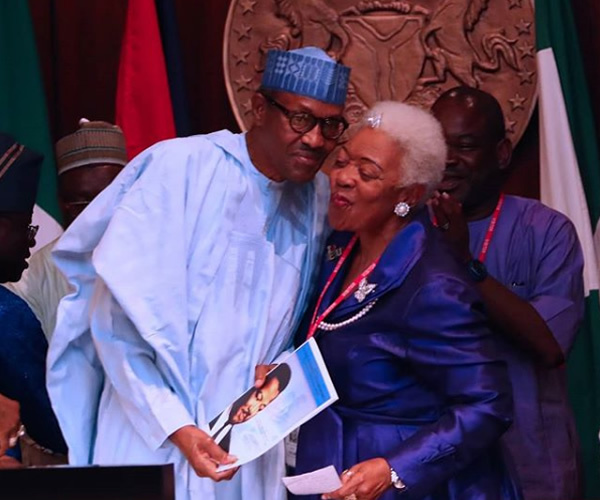 President Muhammadu Buhari receives a plague from Ambassador Erika Bennett and other members of African-American Human Activist Late Martin Luther Jnr during the conferment of The First Black History Month National Black Excellence and Exceptional African Leadership Award 2018 at the Council Chambers in Abuja. Martin Luther King Jr’s nephew, Isaac newton-Farris Jnr, has enjoined Nigerians to unite and join hands with President Muhammadu Buhari to complete the work he begun in setting Nigeria on the right path and building a country every Nigerian would be proud of. “My advice to Nigeria is this., I know that a lot of Nigerians feel a little displeasure with President Buhari moving too slow on some of his reforms. “I will counsel Nigerians to say give this man the time he needs to do the job that he is doing. He is one of the most legitimate leaders that the continent has produced. “And he would if you all just stick to him I assure you he is going to make Nigeria a better place,” he said. He said that though it was not easy to say as a visitor but Nigerian would benefit if they supported him to complete his work According to him, I know for instance what your citizens will say to me, he will identify the corruption but won’t do anything, he says until investigation is done. But that is the proper way to do that. “You know fortunately he is an honest man but if he would say traditional just decide in his mind what is corrupt and not corrupt and just taking action without a process what will happen with the next guy that comes who might not be as honest as he is. “So you need a process. So it is not about the person or personality but it is about the fact. “So I will just counsel Nigerians, I know, I am a visitor it is really not my business but be careful before you vote this man out of office,” he said. The Most oldest person in the Luther family, Dr Naomi King, earlier called on Nigerians to rise up to their responsibility and vote for the candidate of their choice “I want you to take the responsibility and vote when the time comes for the candidate of your choice because you have a voice and your vote is your voice. “Remember that if you love God, you love your neighbour and have in mind what the almighty God has done He will give you the desire of your heart,” she said. Also speaking, Dabiri- Erewa , said the Luther family was in Nigeria to celebrate the 50th anniversary of the death of Martin Luther King jnr “As they celebrate the 50th anniversary in Nigeria which is the first of its kind, we want Africans in the diaspora and Africa to work together for the development of the continent. 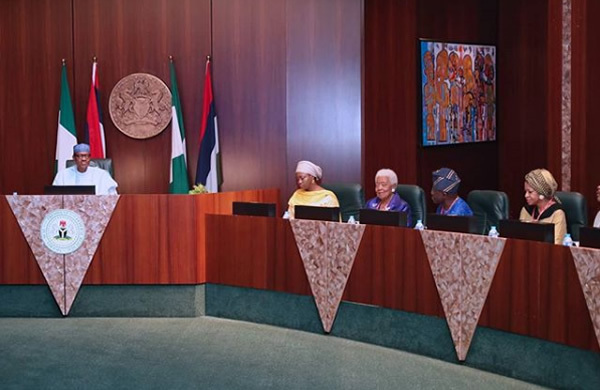 “So it is a major step forward, it is our desire to work with our sisters and brothers of African descent to move the continent forward,” she said Dabiri-Erewa said that their coming to celebrate in Nigeria showed their belief in the country and the leadership quality in Nigeria According to her, the visitors appreciated what Buhari was doing especially in tackling corruption. How credible is this award? We want to know what concerns you too. awsome blog really informative thaks for sharing .